As of the Mars Exploration Rover Opportunity's 413th martian day, or sol, (March 23, 2005), the robot had driven a total of 4.62 kilometers (2.87 miles) since. 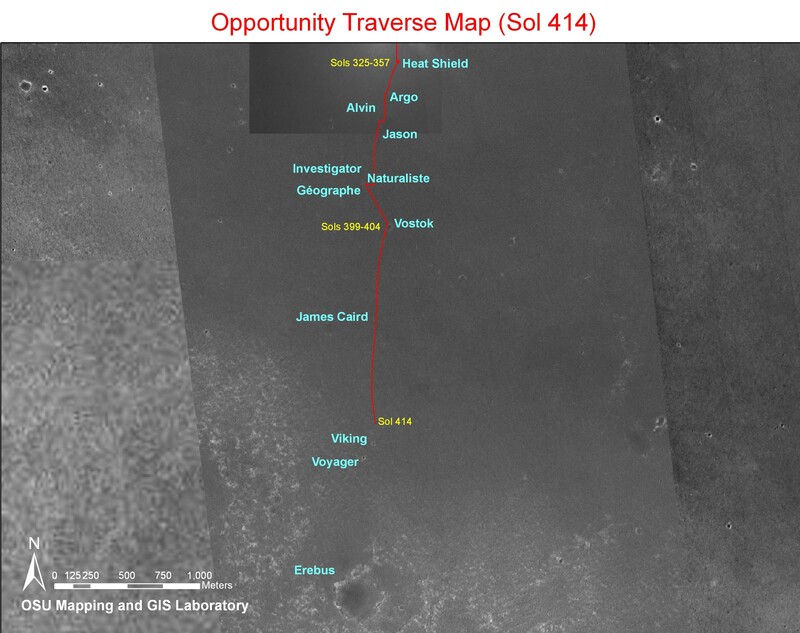 The red line on this image traces the rover's route. The base image is a mosaic combining images from the Mars Observer Camera on NASA's Mars Global Surveyor orbiter, the Thermal Emission Imaging System on NASA's Mars Odyssey orbiter, and Opportunity's own Descent Image Motion Estimation System. The rover has been making rapid progress southward since it finished examining its jettisoned heat shield on sol 357 (Jan. 24, 2005, one year after landing). Scientists are eager for Opportunity to reach an area to the south called the "Etched Terrain," which appears mottled in the map's base images and might offer access to different layers of bedrock than what the rover has seen so far. See figure 1. As of the Mars Exploration Rover Opportunity's 414th martian day, or sol, (March 24, 2005), the robot had driven a total of 4.81 kilometers (2.99 miles) since landing. In this two-month period, Opportunity drove 2.69 kilometers (1.67 miles). As landmarks along the route, it used craters that the rover team informally named for ships of historic voyages of exploration. See figure 2. 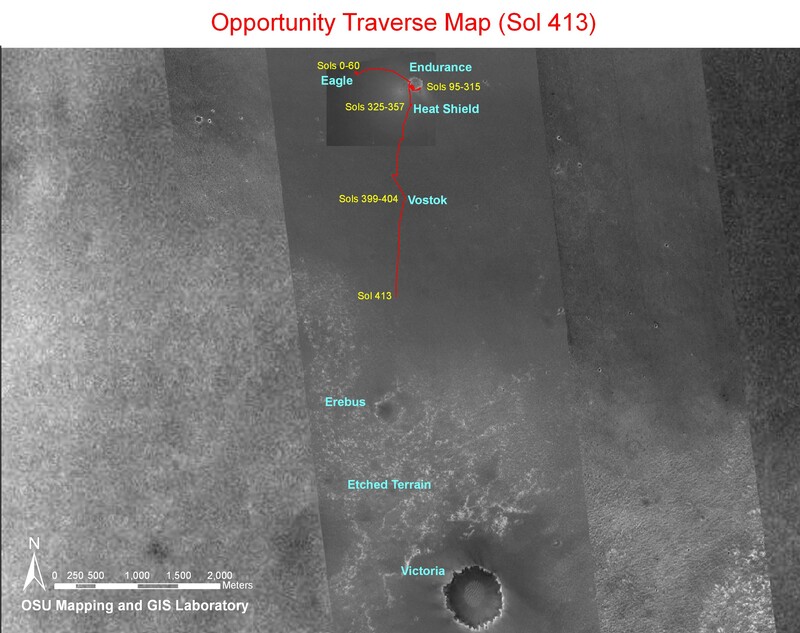 Figures 1 and 2 are traverse maps overlaid on a mosaic of images from NASA's Mars Global Surveyor and Mars Odyssey orbiters and from Opportunity's descent camera. The scale bar in figure 1 at lower left is 2 kilometers (1.24 miles) long and the scale bar in figure 2 is 1 kilometer (0.62 mile) long.